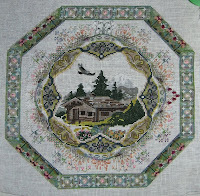 ...and some google searching for WIP pics to estimate the closest colour matches, I've finished the backstitching on Alpine Garden. No idea if it's exactly the colours used in the original, but it looks close. I couldn't make out most of the instructions in the picture included with the chart, it's horribly blurry. I moved some stuff around, and fixed some other things - points of two lines not meeting up properly, etc. And I spaced things out a bit more - everything seemed soooo overcrowded. I also changed threads on a couple, from what I could make out in the instructions, some of the backstitching was to be done in the perle thread - I tried it very briefly, but it was much too heavy and made everything else look unbalanced, especially on my 35ct. I had the same colour of thread in regular floss, so I subbed it and it looks much better. Anyway, this is where it stands as of last night, before I moved my q-snaps. No beads or crystals yet, they'll go in at the end. I've tried beading as I go, but my q-snaps shattered a couple of beads, so now I just wait and do it all at once. Colours are a bit more vibrant IRL, and the fabric is a bit darker. Was hoping my model stuff would be here today, but alas, no luck, so I'm going to keep going with this one for now! I don't mind, I'm having fun with this. wel it looks great, but with your natural designers eye of course you were able to work it out..
hope those supplies turn up tomorow i want to see that model done! !